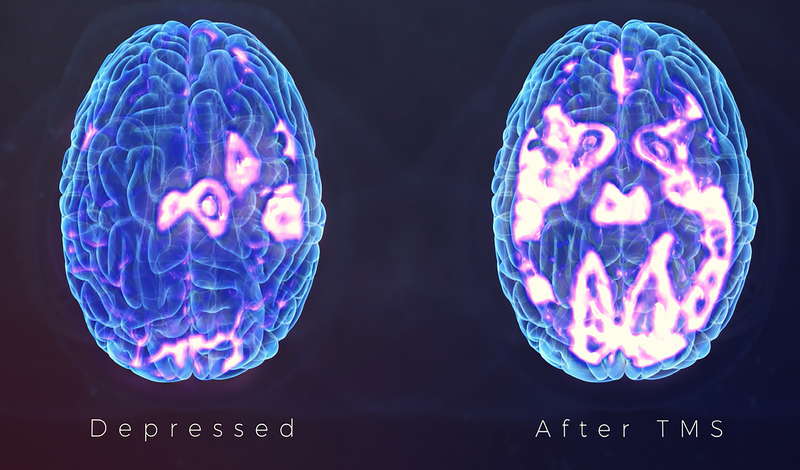 Transcranial Magnetic Stimulation (TMS) is a pain-free, non-invasive and effective treatment for depression, anxiety, addictions and chronic pain. It is recommended by NICE (National Institute for Health and Care Excellence) and the Royal College of Psychiatrists. It’s a relatively new treatment to the market, but it has decades of research behind it. TMS therapy uses a series of repetitive, brief and highly focussed magnetic pulses to stimulate brain cells to increase brain activity. Your treatments are carried out in the comfort of our clinic by an experienced clinician, who will be with you for every step of your journey. Repetitive Transcranial magnetic stimulation (rTMS) is a painless and well-tolerated way of stimulating the brain for treatment of depression and anxiety. It has been in use since 1985. The therapy involves magnetic fields to activate or suppress the brain cells associated with different medical and psychiatric disorders. It has been a subject of research for many decades and is now being used extensively to treat patients in clinical practice. rTMS is an effective treatment for depression and anxiety disorders for whom other treatments have not worked or who cannot or would not like to take antidepressants for any reason. It is increasingly used successfully for treating physical disorders such as chronic pain, tinnitus and even as part of stroke rehabilitation. What are the possible side effects and complications of rTMS?. Some people may describe the sensation of the magnetic pulse as uncomfortable with a knocking or tapping feeling or noise near the head during treatment. Though rare, rTMS has a very small risk of seizures. Highly effective, recommended by national treatment guidelines (NICE) for depression but also effective in chronic pain, Migraine, Tinnitus, anxiety disorders etc. You may be able to stop anti-depressant medication, PREVENTING common medication side effects like nausea, stomach cramps, drowsiness/ insomnia, weight gain etc. Learn more about the full treatment process here. How often will I need TMS? This depends on each individual case and your psychiatrist will be able to advise you on that following your assessment. 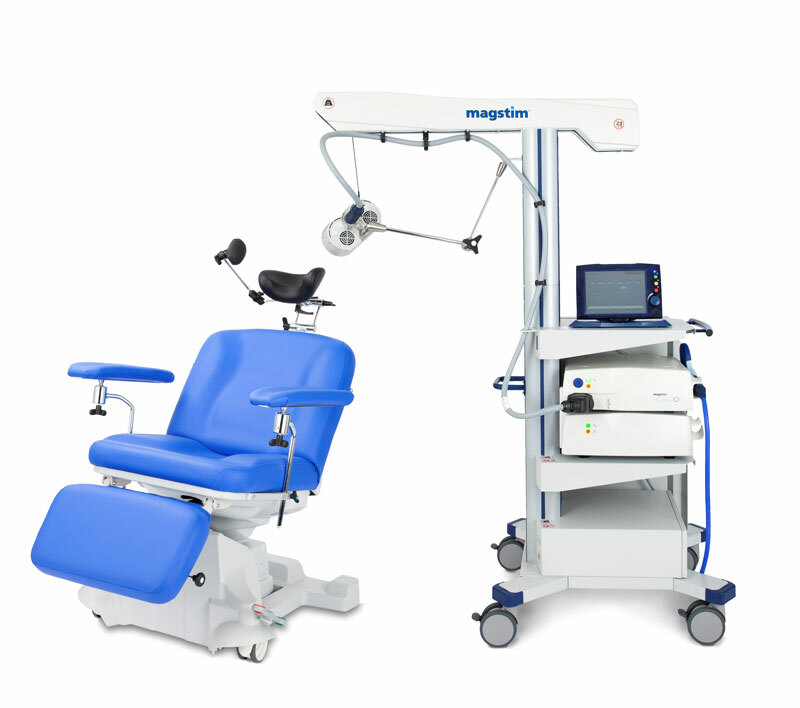 However TMS is delivered for 30 minutes every working day over 20-25 sessions (around 3-6 weeks) in most cases. We can also administer a more powerful treatment using the theta burst technology, which can reduce the duration of treatment to 3- 6 minutes with no change in the effectiveness of the treatment. We are conveniently located opposite London’s Euston station in Camden and we offer ample free parking on-site for our patients. If you are travelling from outside of London, we can help you arrange local accommodation with easy access to the clinic for the duration of your treatment. We have deals with local hotels at 40% less than prices you’ll see online so please ask us if you need accommodation. Although pain-free, some people find the ‘tapping’ sensation or noise of the magnetic pulses near their head uncomfortable . Others have reported a light-headed feeling, a mild localised headache, a tingling in the face, jaw or scalp and temporary hearing problems from the noise of the machine. Although extremely rare, there is a very small risk of seizures. Why hasn’t my GP heard of TMS? TMS was accredited by NICE for the treatment of depression in 2015 so it is still a relatively new treatment in the market, although research into rTMS has been ongoing since the 1980s. Awareness of TMS is growing but there is still a lack of knowledge amongst some GPs about this pioneering new treatment so please feel free to share the recommendations by NICE with your practitioner. We would welcome the chance to talk to any GP or referrer who would like to learn more about rTMS to open the opportunity for treatment to more patients. We don’t believe in selling packages or ‘bundles’ of TMS sessions. This is because every individual is different and some respond faster than others to the treatment. Your mental health is important and we want to ensure you get care that is tailored exactly to your needs to ensure the best chances of recovery, which is why we offer a well-rounded care programme and not just TMS sessions. Our fees start at £200 per session. This is up to 50% less than some other London clinics without compromising on quality. We accept all major credit cards. We are committed to making this highly effective treatment available to as many people as possible. We would therefore consider discounts for certain personal circumstances. Please talk to us to see how we can help you. Is TMS covered under health insurance? Coverage for the treatment often depends on a person’s individual health needs and policy. We are able to offer an initial assessment and help you build a case for it with your insurance company if we feel TMS would be beneficial.